Looking out the window and seeing the Barcelona Cathedral is a unique privilege. There are certain pleasures that are only available to those that stay at the Hotel Colón. 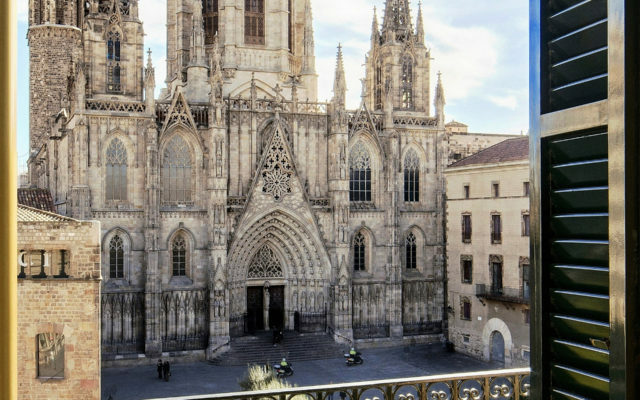 For example, waking up early in the morning, crossing over to the window, pulling aside the curtains, and seeing the image of the Barcelona Cathedral bathed in the sun’s first rays. It’s an image that will fill you with energy throughout the whole day! Many of our 129 rooms in the hotel offer this privilege, in addition to amenities such as air-conditioning, telephone, LCD television with international channels, high-speed Internet, safety deposit box, a well-stocked mini-bar, and the finishing touches of a 4 star hotel. If you are traveling for leisure, after a nice shower and a full breakfast, you’ll find it convenient to have the main tourist attractions within walking distance. If you are traveling for professional reasons, having two ample lounges at your disposal offers you infinite options for any event, convention, business meeting, or celebration. In both cases, it’s good to know that, for lunch or dinner, you can depend on the excellent service at the Cathedral restaurant. All of these reasons make a stay at the Hotel Colón unforgettable. What more can you ask of a hotel?